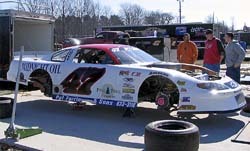 This weekend, Corey Williams will get to race for the first time in 2005 as the PASS Pro Stocks (Super Late Models) make their season debut at White Mountain Motorsports Park. The tough part about that is that for Williams is that already this season, he’s been watching his peers get to race for a few months now. years ago, Williams defined Legends racing in New England by sweeping 27 features in 2003 at Beech Ridge Motor Speedway (ME) and on the New England Legends Tour. Last year, Williams made the step up to full-sized cars and dove in the deep end of the region’s racing pool by competing full-time in PASS. And Williams can follow right along with the adventures of those drivers. While his contemporaries are already racing, the New England winter has kept Williams off the track so far this year. But that has allowed Williams a little bit of time to do the normal things that 19-year-olds do. “I’m pretty much no different from anybody else,” said Williams. “I like to have fun with my friends on the weekends. We like going go-kart racing and having a good time. Beating Williams in a Legends car was not an easy task. How do you top that? Well, Williams did so by going undefeated all season long in his New England region, defending each championship from the season before and being nominated, along with PASS drivers Ben Rowe and Sam Sessions, as Maine Driver of the Year at the Northeast Motorsports Expo. When Speed51.com recently caught up with Williams, we noticed several busted knuckles on his hands from working around street and race vehicles. This isn’t just a kid that pretends to be working on his own equipment. It’s a case of where he needs to work on his cars or they simply won’t be prepared to get on the racetrack. “I work at my father’s auto repair shop [Dan’s Auto Repair] during the day and when we aren’t working there, we are over at the race shop wrenching away and getting ready for the year,” said Williams. That race shop, in coastal Boothbay, Maine, is where Williams and his family managed to put together one of the Winn ingest Legends campaign in the county, just a few seasons ago. 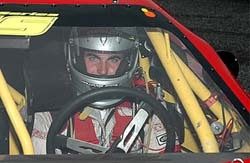 The year was 2003 and Williams had just come off an amazing rookie season where he won the track championship at Beech Ridge Motor Speedway (ME), the Maine State INEX Legends title and the New England NELCAR championship. Williams (L) helps out at his recent test. competition in a Legends car, where the rules are designed to keep racing tight? The next step for Williams was to jump into full-sized cars with both feet. He skipped Saturday night racing and went straight into the PASS ranks, but did so with a car that might have been better suited to run a local track. On any given weekend so far this year, Williams has been able to flip on the television and see drivers of his own age group that he has raced against do some pretty impressive things in front of a national audience. Kyle Busch won the pole for the Nextel Cup race at California Speedway and finished second in the race at Las Vegas. Reed Sorenson won the Busch Series event at Nashville Superspeedway (TN). Those are both guys that Williams has gone wheel-to-wheel with. That performance at Waterford raised some eyebrows. 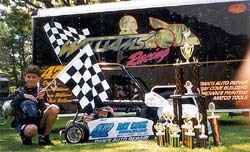 Mason had previously owned winning racecars driven by Andy Shaw and his equipment was just what Williams needed. So this year with the new equipment, Williams is ready for the season to get started. A winter of work helps as well. Williams had a few different looks in 2004. 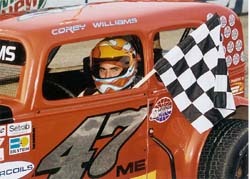 He started out with a white #47 and also ran a red car. It’s not just the equipment that Williams hopes will make his 2005 season. He is also banking on some new knowledge from going to school this winter. The year might also be pivotal for Williams’ career as well if he plans on moving up the racing ladder. At age 19, he is in the position to move up in racing, just like many of guys who he has raced against. 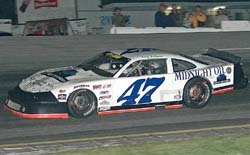 Age used to not be so critical when it came to a Northerner going for a ride in one of NASCAR’s top divisions. Ricky Craven, Mike McLaughlin and Joe Bessey were all well into their 20’s and 30’s before making the jump to the big leagues of NASCAR. But times have changed in racing. Now, teenagers are the hot community when it comes to driver development deals and Williams has the goal of being noticed by one of those operations. There is no doubt that Williams is ambitious, but he’s no matter what happens in his future, he is just thrilled to be where he is now. After all, just driving a racecar is what he has always dreamed about. Winning and moving through the ranks are cherries on top of his sundae.